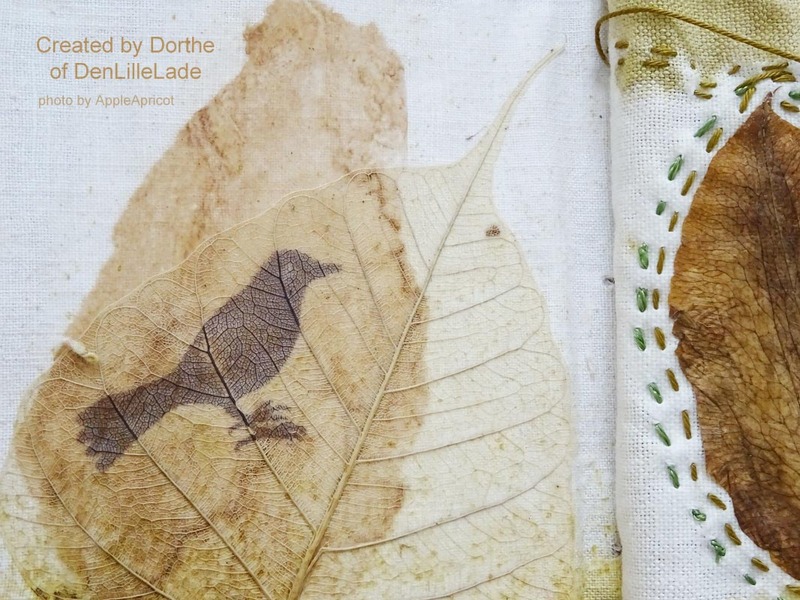 Recently I was the happy receiver of some gorgeous art made by dear Dorthe of Den Lille Lade. I'm a big fan of her nature inspired work. She is a true mixed media artist. 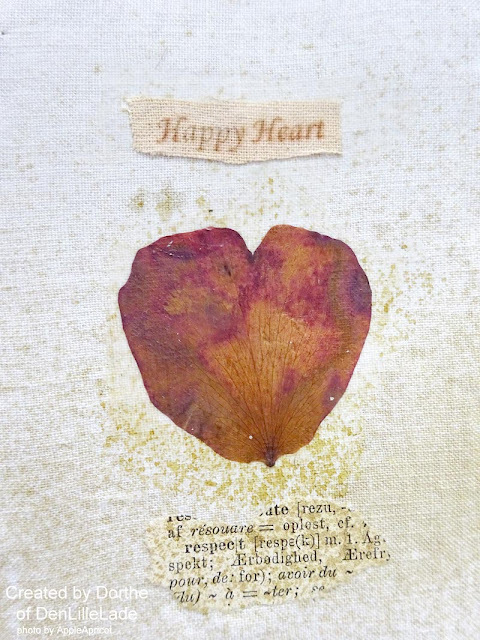 She makes both shabby romantic art and nature inspired art, in which she combines her nature finds like leafs and driftwood with paints, fabrics and laces, and other media. Last year I had the pleasure of interviewing her and it was really nice to learn more about her artful journey. Last week a beautiful package of hers arrived. 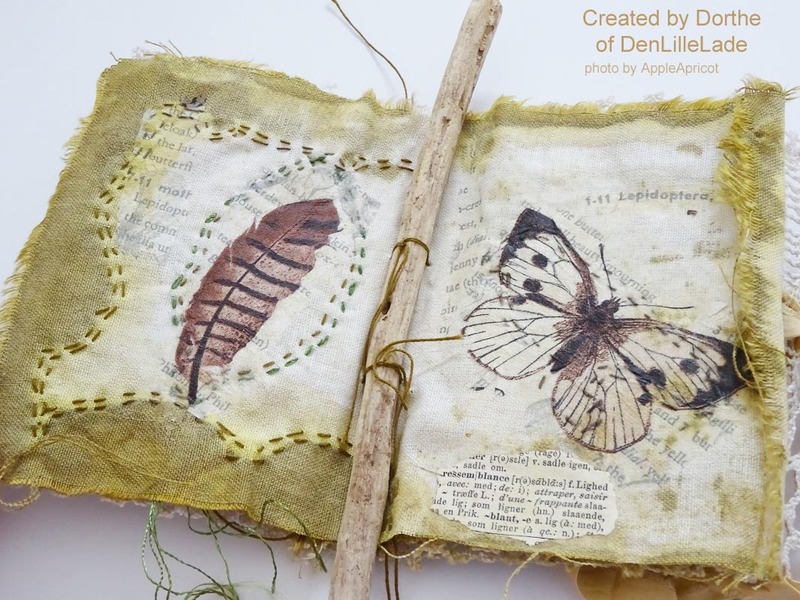 In this blogpost I'll share with you the nature inspired art book she made. The other gifts in the package I'll leave for another time. When I opened this, I had no idea what to expect inside. Was it a wrap? A folded collage perhaps? Untying the knot and lifting the lace on the outside brought me to this beautiful first page. A happy rose petal heart. "Oooh yippee!" I thought, it is something made with nature finds! ... and of course the beautiful driftwood which holds it all together. When I first started crafting, I came across Dorthe's blog Den Lille Lade and since then my work is greatly influenced by the inspiration I find in her work. Thank you so much sweet Dorthe, for your gorgeous art book and gifts, your generosity and kind heart, and for the friendship we share! Dearest Wen, thank you for presenting my little book, so beautifully, your photos are as always, gorgeous . 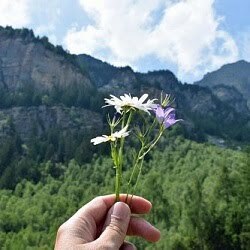 I enjoyed creating it for you, knowing how much nature means for you, and your life. 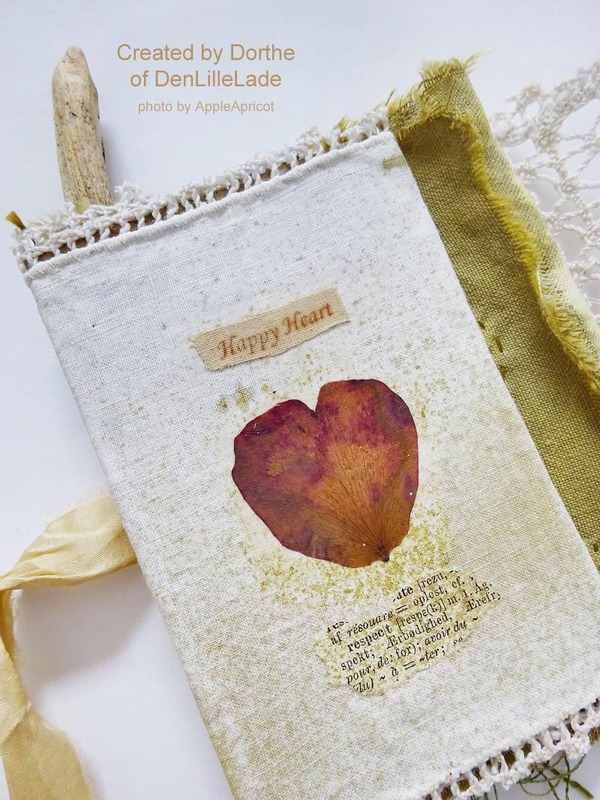 So pressing the rose petal, and the leaf, I knew would be perfect for adding to a booklet for you, my dear friend . Thank you for loving it, and the other little things. I send you love and hugs. You will hear more from me, tomorrow . Gorgeous, what a beautiful gift!! Wen, this is just beautiful! 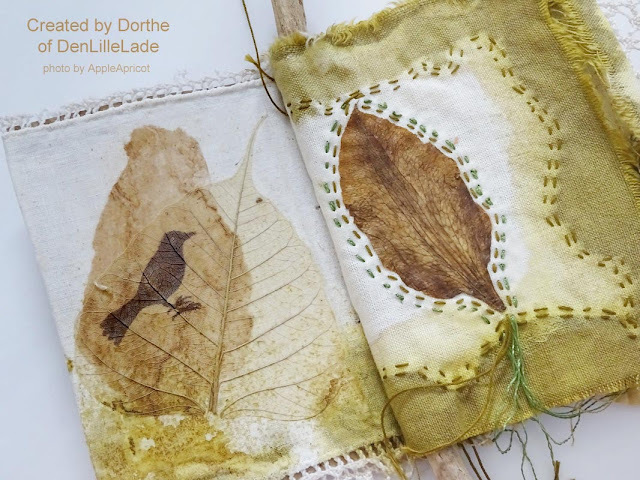 Dorthe is so, so talented! What a lovely gift! I love every single page!!!! I tried to pick a favorite but could not. they are all equally beautiful! 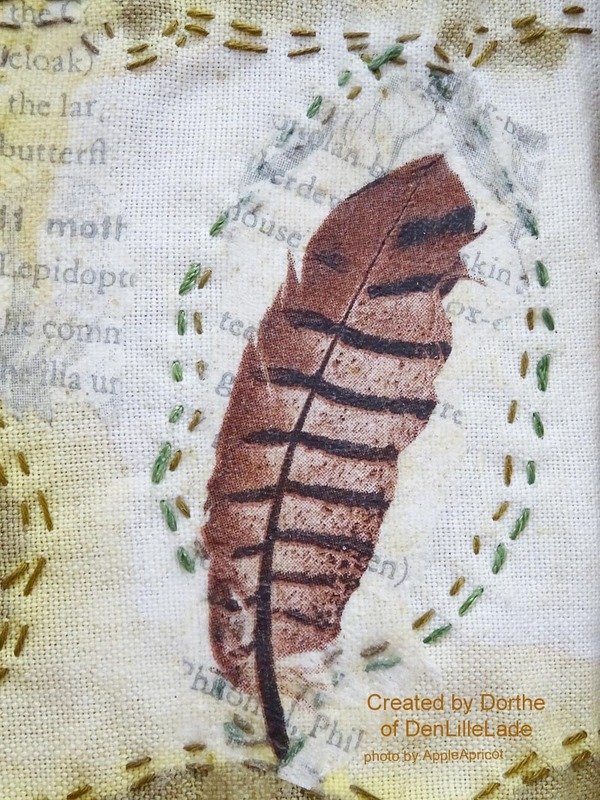 Thanks for sharing her amazing nature inspired, shabby mixed media work. I enjoyed looking through it! Dear Wen, I'm sure your breath was taken away when you opened and untied Dorthe's gift of sheer creativity, imagination and heartfelt generosity! 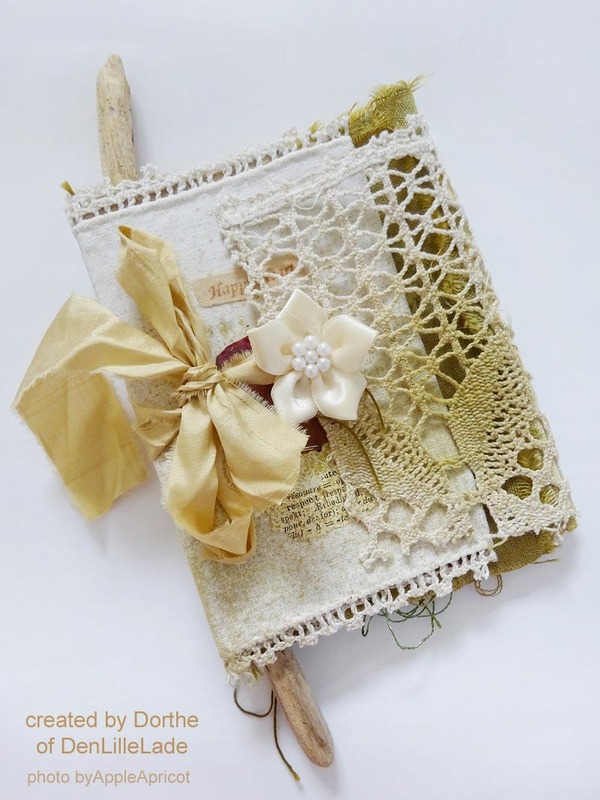 I know how I felt as I scrolled to see what each beautiful, lovingly made page brought to life. I sat, simply amazed and in awe of the mind, heart and soul which houses her kind of understanding and closeness with the majesty of nature. Her calling to bring it to life through her gifted hands and the love that calls her to share her entire experience with others, especially those she holds most dear. Thank you for sharing the prize of such a precious friendship. Wen, my goodness, I did go on immediately after being struck "enchanted" with your gift from Dorthe. I then read your interview with her and was furthered inspired! I got a glimpse, a very telling glimpse of the mind, heart and soul of her. I can't say I fully understand all of what I glimpsed, but I don't think I was supposed to...that is the rest of her magic. Thank you dear Wen and again. What an amazing gift! It's one of those things that fingers itch to touch because just using eyes just isn't enough. Lucky you! Such a special treasure to keep forever! It is truly a gift from the heart from her to you. Wauw zeg, wat een mooi, fijntjes, romantisch, teer werkje is dit. En.....toch ook weer stoer door het gebruik van takjes en touwtjes. 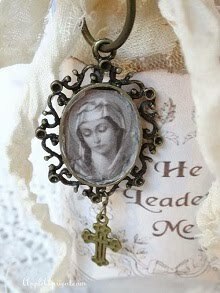 Such a beautiful work of art, I am sure you will treasure it forever!! Love the stitching she did on all the pages and a great theme to the book! Oh Wen, such a lovely gift! 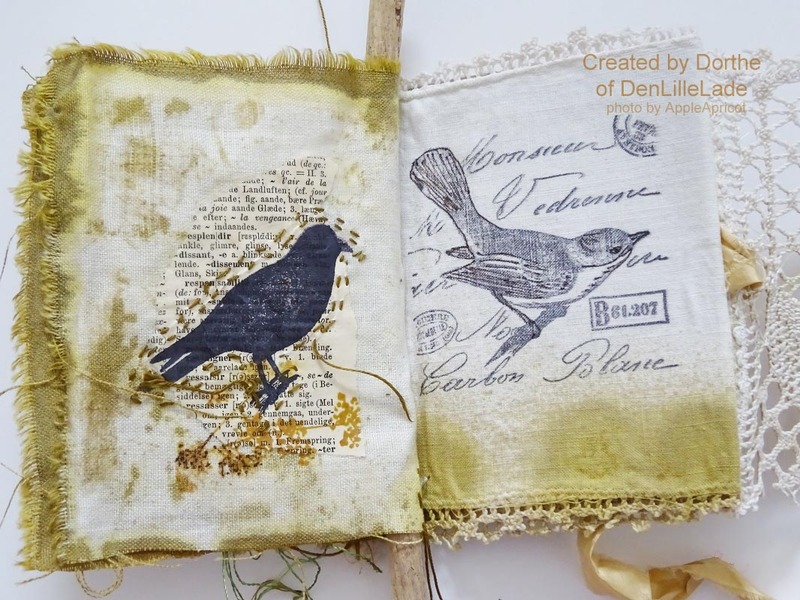 Dorthe makes so beautiful creations. Oh Wen this is the dearest little nature book from Dorthe! She's just the best friend! It is adorable! Hope you are going better my dear friend!